This is another quote sent in by a blog reader, and we seem to be on a roll with Thomas Byrom quotations, for this is another from his poetic but highly inaccurate translation of the Dhammapada. It was found on the quotes site, Thinkexist. ThinkExist, like every quotes site I’ve visited, is very unreliable. As far as I can see, they do no fact checking at all. You’ll often find the same quote attributed to different people, and it’s full of obvious misattribution. All the quotes sites copy each other’s material, so once one of them gets hold of a misattributed quote they all end up with it, lending the quote a false sense of legitimacy. And when authors want to spice up their books or blog posts with a wise quotation, they end up putting the quotes into even wider circulation, and give them even more of a sense of legitimacy. This particular quote is found in books by Jack Kornfield and Lama Surya Das. Of course the ultimate, when it comes to the appearance of legitimacy, is having a quote in a book that’s described as a canonical text, which is what we have here. 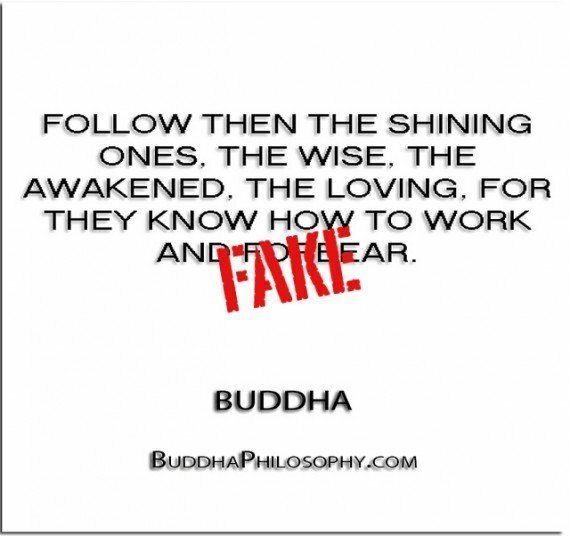 But there’s nothing in the original about “shining ones” or “loving” or “knowing how to work.” “Shining ones” in fact would tend to suggest, for those in the know, the devas, or gods. The word “deva” comes from a root meaning to shine. Since the original is talking about those who are awakened, rather than gods, this is highly misleading. Basically, Byrom, in producing his “rendering,” seems to have just bluffed his way through the text, probably using other translations as a rough guide but often taking random words from the Pali and then weaving them into his own creation. His Dhammapada, to my mind, is a bit of a stain on the otherwise very fine reputation of Shambhala publications.